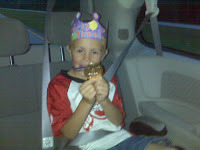 The Kimball Family: Four Boys and a Girl: Chuck E. Cheese - Can You Say PAR-TAY? 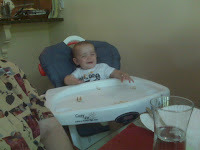 Here is a picture of master highchair escapee, Jax, taken by Grandpa. 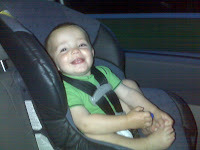 Here is the ECSTATIC BIRTHDAY BOY - Happy Birthday, Jonah! And here is the middle bro, E-L-I! We had a fun party, just the family and the neighbor boy, Geordan. It was nice to not have to watch 10 kids in a place like that, trying to get everyone back for dinner, then cake, etc. I got off SO WAY EASY this year. 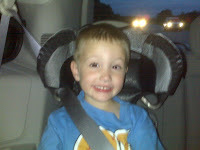 Grandpa paid, Chuck E. Cheese cleaned up, and we are ALL happy - ESPECIALLY Jonah, which is MOST important!